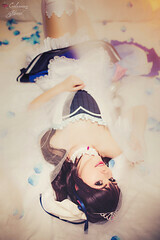 The cosplay costume company COSPLAYSKY.CA offered me to review this Idol Master cosplay costume to review. I really love cute Idol dresses and I love Uzuki! So I wanted to use the dress for Uzuki’s starlight stage outfit. So here is now my review! The costume arrived in a secured packet. I got Size M. I depacked it and took a first view of costume and details. Here are photos of the costume in detail. The things I added on the final costume by myself for Uzuki’s look were the clock, the pink bow, the pink gemstones, the crown, hair bow and shoes. Click on the photos to see the photos in bigger detail! – The „lace“ on all edges is made with a laser cutter to make the exact bows and shapes the dress has in the original source. This would be very hard to make by yourself at home. – The stockings that came with the dress were very very tight. I wished the socks were a bit wider on the upper leg part. And here are now the photos of the final look. 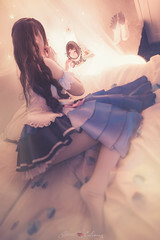 I am wearing the costume here with Cospicky’s Uzuki wig and added the clock, the pink bow, the pink gemstones, the crown, hair bow and shoes. Photographer here was Captured.